It is important to recognize that a gas moves much faster than steam because steam can only advance when the reservoir is heated to steam temperature. This means that gas has two effects. The first is to reduce the viscosity in the oil ahead of the steam front. 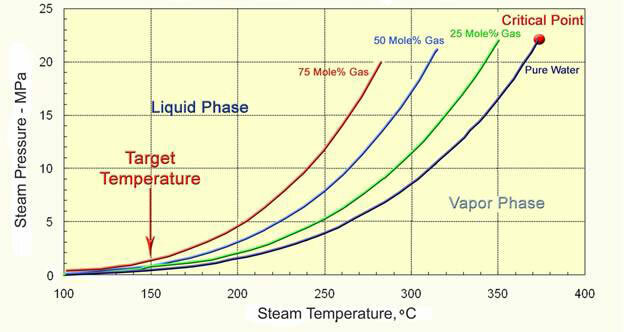 This is shown the first figure below, where a region of higher GOR precedes the steam front in the simplified schematic of a high-pressure steam-gas process. The GOR is high when the temperature is low. 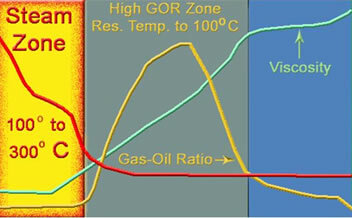 Then the GOR decreases as the oil is heated until the steam zone is entered where there is little gas in the oil. The oil’s viscosity is kept low then by the high temperature. Any gas added to the steam has this effect on oil viscosity. So addition of nitrogen, CO2 of reservoir gas to steam all can accelerate oil production. 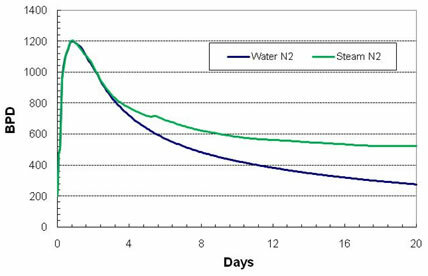 This is shown in the next figure where adding nitrogen to both steam and water results in the same initial production. The result of these two effects is faster production of more oil as shown in the figure above.